Notebooks made for the biggest news, but energy hikes and a tragic gas explosion also drew headlines. Abombshell investigation by the La Nación newspaper seized the news agenda this week, shining a new light on Kirchnerite corruption. The ‘Los cuadernos de las coimas’ exclusive, based on eight notebooks acquired by the paper, prompted a series of raids, arrests and gives former president Cristina Fernández de Kirchner a new legal headache. See the following pages for a full explanation of events. More than half of the victims of road-traffic accidents in Buenos Aires City, injured or deceased, are under the age of 35, new data has revealed. Statistics released by the Buenos Aires City Ombudsman’s office showed that 54 percent of victims injured or killed in road-traffic accidents in 2017 were young. Of the 103 fatal cases recorded in 2017, 48 fell under the age of 35. Electricity bills will rise between 14 and 28 percent this month in Buenos Aires City and province, as a result of increased wholesale costs and the withdrawal of subsidies, Energy Minister Javier Iguacel announced on Wednesday. Iguacel placed the responsibility for billing everywhere squarely on provincial governments and grids, criticising Córdoba and Santa Fe for virtually quadrupling charges but praised San Juan and Mendoza for their “efficiency” (with similar criteria the increases in Buenos Aires province could be 15-17 percent instead of an average 24.4 percent, he said). A public hearing over the gas bill increases due as from October will be held on August 15. Distributors blame the recent devaluation for costlier electricity and gas. A group of physicians have been suspended after taking photographs during an operation, posing alongside an anaesthetised patient’s gaping wound and exposed organs. Local health officials said a doctor, an anaesthetist, two medical assistants and a nurse had been suspended from work at the San José de Capilla del Señor public hospital in Buenos Aires province. The group took the photos in one of the hospital’s operating rooms, while the patient was undergoing abdominal surgery. The scandal came to light after some of the images were posted on the Instagram account of Dr. Lorena Olguín, the surgeon who carried out the operation. The stage was set for the final debate over the abortion bill on the Senate floor next Wednesday with supporters and opponents both failing to obtain sufficient signatures to amend and reject respectively the original text of the legislation approved by the Lower House. Half-a-dozen senators who sought to soften that text, in order to increase the chances of success, eventually managed to negotiate the support of Kirchnerite and other legislators preferring unconditional approval with the help of Federal Peronist caucus leader Miguel Angel Pichetto but even then fell one short of the requisite majority of 27 signatures from the 53 committee members. The fate of the bill now hangs in the balance with 36 of the 72 senators reportedly opposed. In their running battle with the Mauricio Macri administration some trade unions are being saddled with hefty fines for defying compulsory conciliation orders. On Tuesday a labour court slapped a billion-plus injunction (1,052 million pesos, to be exact) on the teamsters. And the next day it was the turn of Suteba (the Buenos Aires province teachers union militantly headed by Roberto Baradel), which was fined 659 million pesos by the Buenos Aires provincial government’s Labour Ministry for this week’s 48-hour strike in defiance of compulsory conciliation. The deputy headmistress of a Moreno school and a porter were killed early on Thursday morning by the explosion of a gas canister in the kitchen. The victims were identified as Sandra Calamano, 48, and Rubén Orlando Rodríguez, 45. Around three-quarters of Moreno have no gas main connection, according to Clarín. Angry teachers unions from BA province and City, including the influential UTE-CTERA and Suteba groupings, said they would strike on Friday in protest. Jujuy social activist Milagro Sala fainted on Tuesday while lunching at her home where she is being held under house arrest. She was rushed to hospital where the director reported her recovered later that evening. 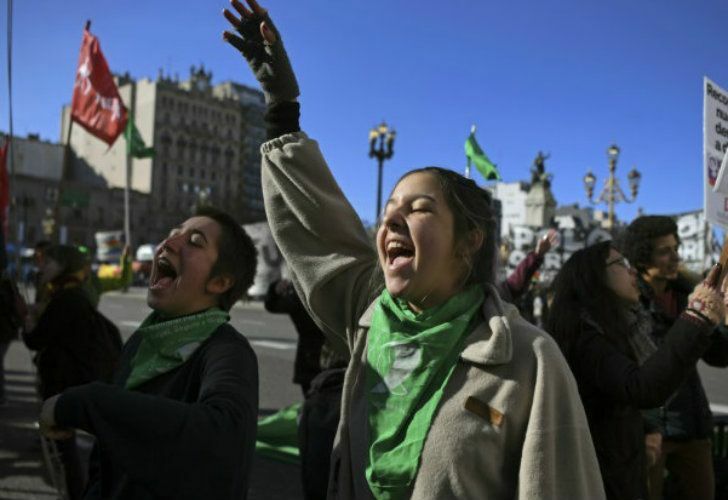 After months of to-and-fro negotiations, the City of Buenos Aires will finally cease being the only district in the country without its own branch of the ruling Cambiemos (Let’s Change) coalition. On Thursday afternoon the UCR Radicals signed a commitment to put an alliance in place during the next few months in time for next year’s elections. The agreement clears the way for a primary between Mayor Horacio Rodríguez Larreta and his 2015 run-off rival Martín Lousteau, who has recently joined the Radicals – previously the main obstacle to forming the coalition. The first anniversary of the disappearance of pro-Mapuche activist Santiago Maldonado last Wednesday was marked by a march on Plaza de Mayo and the presentation of the documentary film El Camino de Santiago (directed by Tristán Bauer and scripted by Florencia Kirchner). At least six people were arrested following incidents during the presentation after an anarchist grouping broke theatre windows to protest what they perceived as a distorted image of Maldonado. The dead man’s brother, Sergio Maldonado, addressed the Plaza de Mayo rally with an indignant speech. Santiago Maldonado ceased to be a missing person last October 17 but questions about his death and the investigation have been raised in both the film and beyond.